Despite it's simplicity Gedit (it's default "Notepad" for Gnome for Linux) has a lot of useful functions. One of them is syntax highlighting for different programing languages, scripts, htlm, xml, etc. By default Gedit supports about 100 different languages but unfortunately Gcode not in that list. 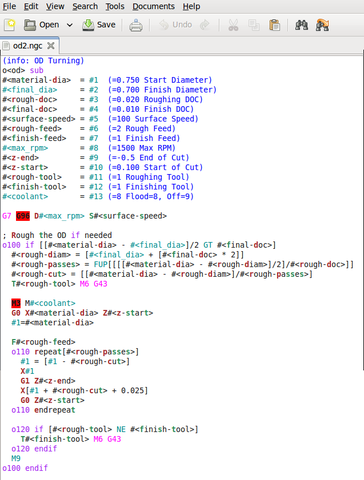 So I've decided to write Gcode syntax highlighting for Gedit. Save it into "/usr/share/gtksourceview-2.0/language-specs/". Restart Gedit if it needed. If you want to st up color scheme same to my do the following Edit->Preferences->Fonts & Colors and select "Oblivion". PS Just before I've finished my gcdoe.lang I've found almost the same one at wiki.linuxcnc.org. But there some major differences. My version differentiates different G and M codes for example coolant M codes M7, M8 and M9 are drawn in blue, start / stop M codes are on red background. Also some spindle and feed parameters which can appear inside the line with G code are drawn in green so they become more visible. Hope there wont be any bugs/mistakes but if you've found one do not hesitate to report it . I installed the Gedit G-code highlight file, it's much better than I had previously, but still there are some small issues. Especially with the named parameters. Fixed version is in the header. Do I get it right - everything after semicolon till the end of line is a comment? Fixed. See updated file in the header. PS Thanks for the bug report! Sure, mainly I meant here the Russian language content. Google translation is quite usable. Although I learnt almost ten years Russian language, but I hardly can remember anything. Some spindle and feed parameters which can appear inside the line with G code are drawn in green so they become more visible.